This is not meant as a tutorial on MobX but hopefully it can be inspirational for people who have grokked how React's setState works but now feel they need to move the state management in their React app out of the components. It's a really simple Todo list application based on create-react-app. Not much to read into at this point. As part of this change, I moved the logic from the App component and created a new sub-component (that App renders) called TodoList. This was not necessary to add MobX. There are a bunch of little unrelated edits in that such as deleting some commented out code. store.items.sort((a, b) => b.id - a.id); doesn't actually work. You're supposed to do store.items.replace(store.items.sort((a, b) => b.id - a.id));. Later I made the Item component also be an observer and not just the TodoList component. 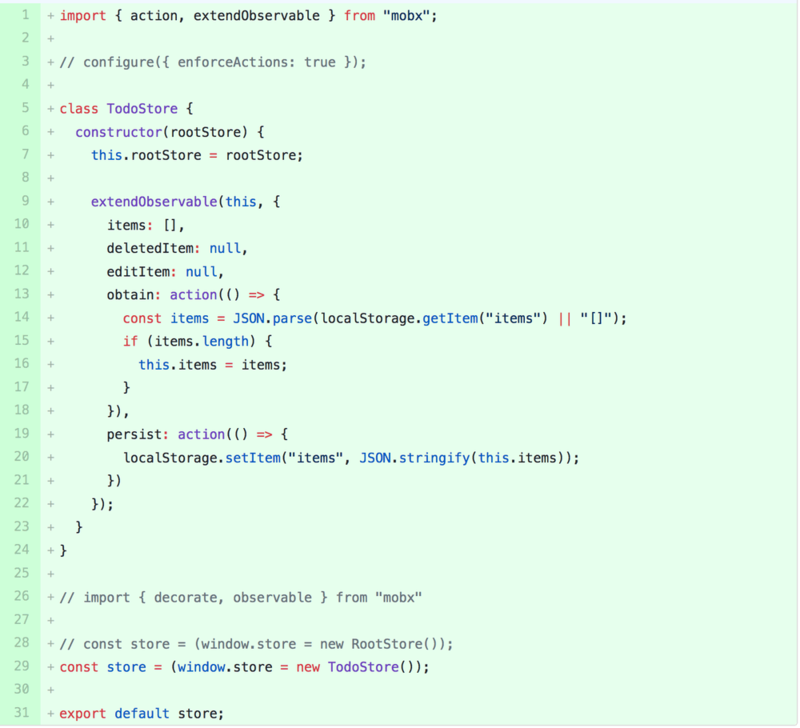 The exported store is called store and, in this version, is an instance of the TodoStore class. 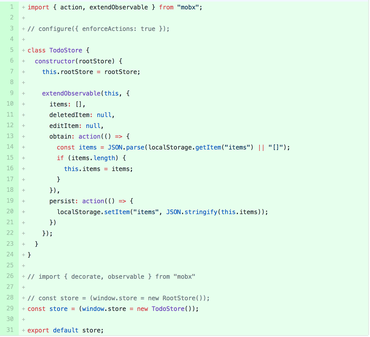 The intention is to make store be an instance of combined different store classes, with TodoStore being just one of them. Caveat last but not least... This diff does not much other than adding more library dependencies and fancy "observable arrays" that are hard to introspect with console.log debugging. Add react-router to the mix so opening the Todo list is just one of many possible views. Now the Store.js file can be all about data. Data retrieval, storage, manipulation, mutation etc. The other components will be more simple since their only job is to render that's in the store and send events back to the store based on user actions. Note that the store is also put into window. That means I can open the web console and type store.items.text = "Test change" and simply by hitting enter the app re-renders to this change.